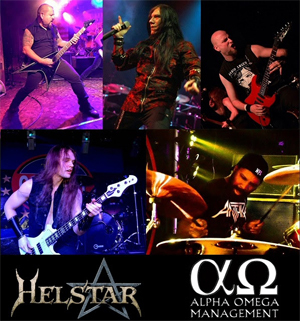 Alpha Omega Management has announced the addition of heavy metal monsters HELSTAR to its roster family, who just recently signed a contract with EMP Label Group, which was created by MEGADETH bassist David Ellefson. Houston, Texas based HELSTAR - formed in the early '80s by the band's guitarist Larry Barragan and vocalist James Rivera - have no need of long introductions, as their successful career speaks by itself, being the influential force in the American metal scene, since the very beginning. Their latest effort This Wicked Nest came out to the masses in April 2014, promising the band's powerful return to the scenes. Currently HELSTAR are preparing to unleash their new album, entitled Vampiro, another opus of tales of Dracula and vampires like the band's all time most acclaimed 1989 release Nosferatu (produced and mixed by Bill Metoyer) in the same vein musically with shades of who HELSTAR are today. The first single "Black Cathedral" will be released on April 9th, via EMP Label Group. Vampiro is being mixed by Bill Metoyer and will certainly prove to the world that there is much much more left in these Texas metal legends. "It's with great pleasure that HELSTAR is proud to announce we will be working with Alpha Omega Management group. With a team like this that has satellite offices around the globe, we definitely feel the band will receive the exposure and promotion we deserve. This all was instigated by our lifelong friend and producer Bill Metoyer who recently joined the Alpha Omega team weeks prior to our decision to work with him in this sense on top of him still mixing our music to this day. Alpha Omega! Let's conquer new and bigger horizons!" "We're extremely honored to welcome HELSTAR to our roster family! Already from the very first exchange of messages and skype chats, we found out to be on the same wavelength with James and the whole band! We are ready and cannot wait to bring out to light the great plans we have to conquer new and bigger horizons! New Spring, New Greater Era has began! HELSTAR is ready to rock the stages worldwide, harder than ever before! Stay tuned for next announcements, soon!"